My current projects have been taking me a lot more time than I had hoped. It's almost as if I'll never get any of them done, but I know given time they'll finally get finished. I felt like I needed some sort of quick knit fix to make myself feel better.. so I could say HEY I finished something! I was going through my stash over a week ago and came across a bunch of sock yarn I have stocked up. A few years ago I went yarn shopping with my Mom and she picked out some yarn for me to knit some socks up for her. Unfortunately the last pair I was working on the needles busted and never got around to fixing it. 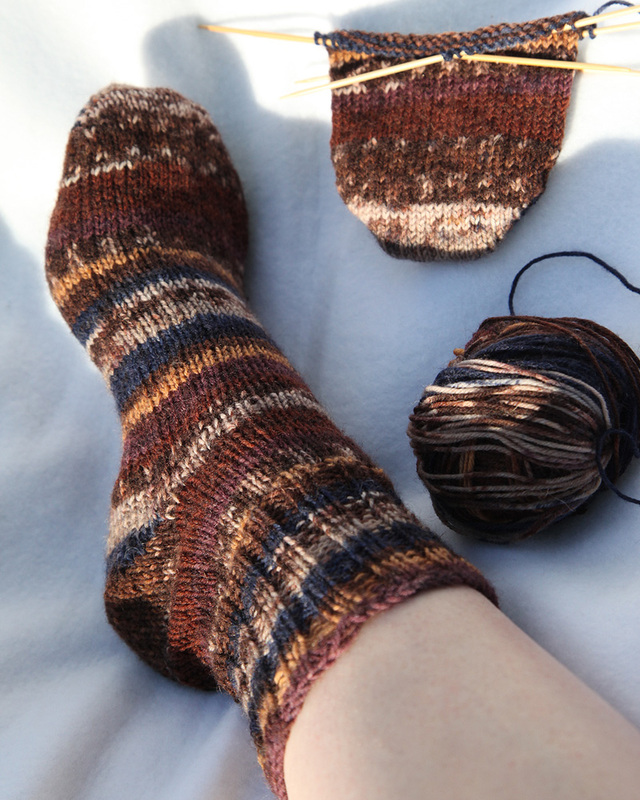 I forgot just how quickly I could knit up socks and how much fun and satisfying they are to knit. So far I've knitted up from a pair of matching yarn balls one pair of yoga socks and one normal sock with another to match soon. It feels great to be able to see that I have finished a recent project. 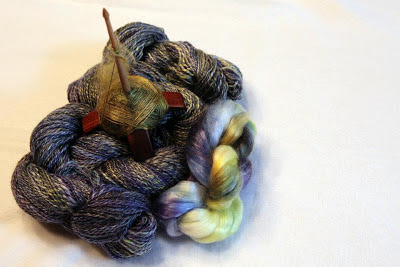 I have four more balls of yarn that need to be knitted up into socks for Mom and several for myself. Here's my stash of sock yarn.. well it's only half of my stash. I have two balls of each color except for the black and tan Bamboo and Ewe. 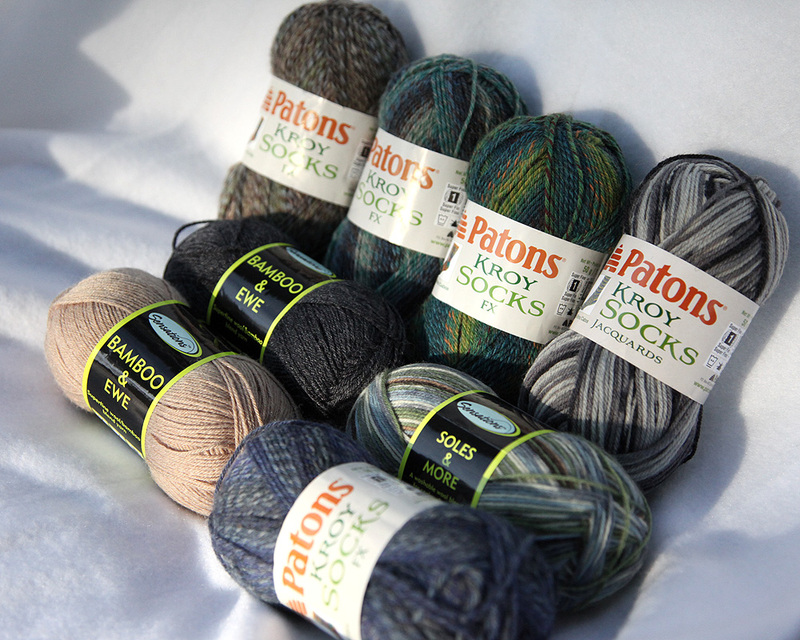 The gray scale Patons Kory Socks Jacquards along with the blue Patons Kroy Socks FX are both for my Mom and the rest are mine hehehe. I've been looking at a lot of sock patterns so far this weekend and I've seen a lot that I'd like to do though I'm not sure these types of yarns would work best for the patterns. Here's four patterns I have my eyes on. 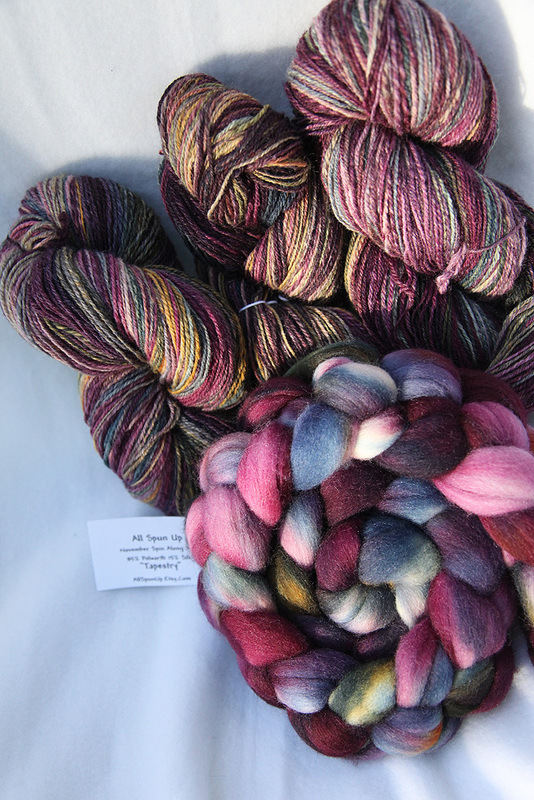 See more beautiful sock patterns in my Favorites list on Ravelry. 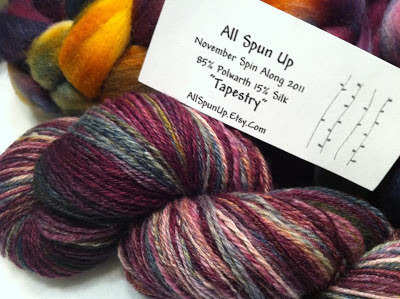 Since my last update I've completed another 8 oz of "Tapestry" by All Spun Up the November Spin Along for 2011. 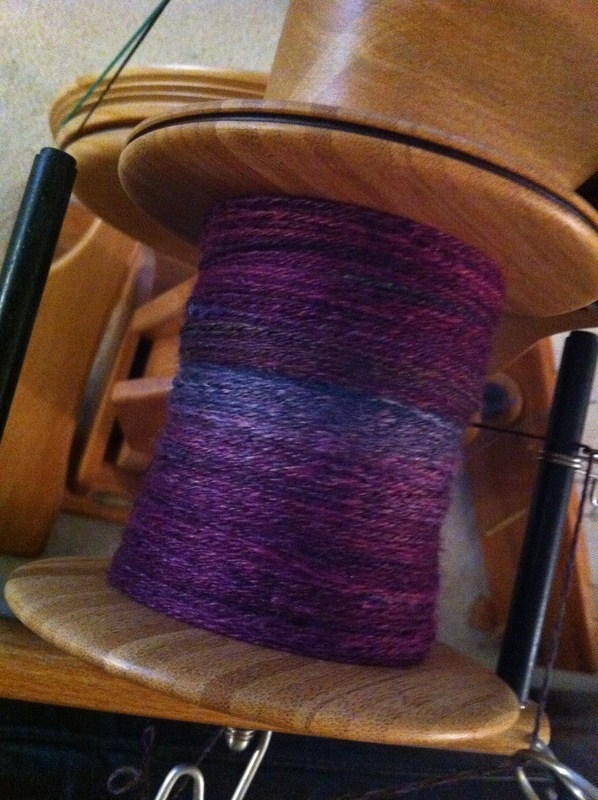 I'm loving how beautifully Polwarth/Silk spins up and I'm feeling pretty comfortable with Navajo plying. Two of these bumps will become socks one pair for me and another pair for mom. Not sure what the other two bumps will become. It's really neat how despite being dyed with the same colors how differently each one turns out due to the variation of how much or how little certain colors show up. In other news we are still waiting to hear back from the Seller's Lenders concerning whether or not they have approved our offer for the house we are hoping to buy. I really hope we get the place. The house is great needs some love but over all it's a wonderful place and the location is so tranquil. If we get it I know I'll be outside working during the summer soaking up the peaceful nature sounds and blue skies. More about the house to come if we do get it. I was inspired by Coby CJKopec Creations to spruce up my crafty places and took some photos to share. We are currently waiting for our offer for a House to go through on a Short Sale hoping we get it fingers crossed. 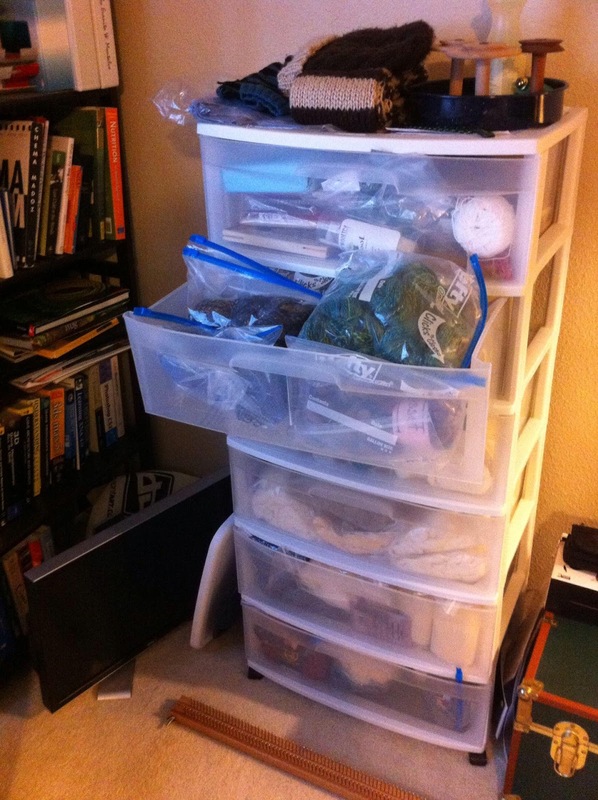 I'd love if when we got our own place that I could have a better area to house all of my fiber goodies as right now my crafty stuff is spread across three areas of the house. 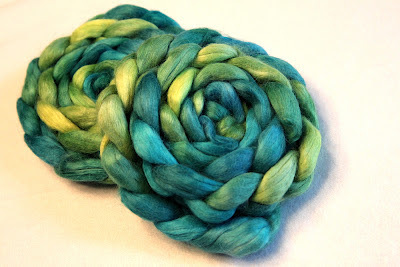 I'll share some ideas of what I would like to see for my own fiber space. Unfortunately I don't have the space to properly store my fiber in all it's glory plus with the carpet beetles we had I had to make sure everything was sealed up to prevent infestation. Luckily everything has been good no fiber damage YAY! 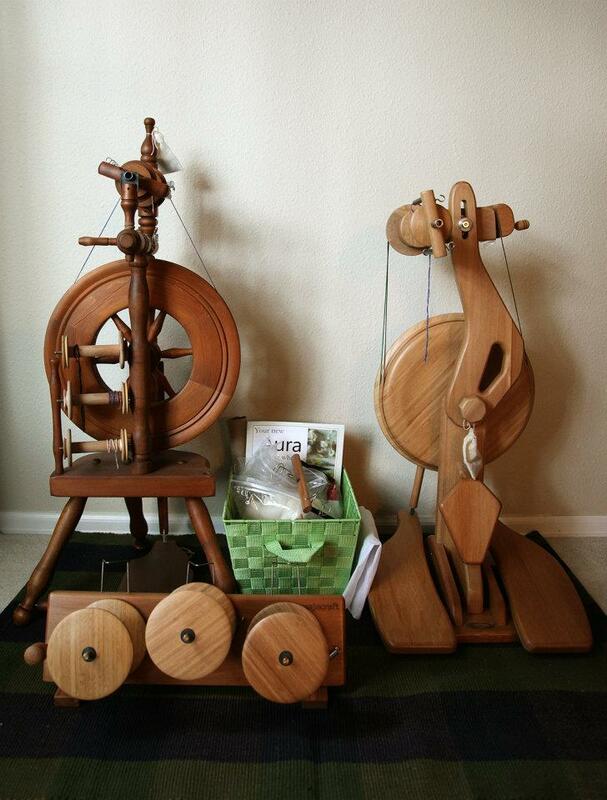 Here's my two spinning wheels that I use to make all my beautiful yarn along with some other goodies like my Majacraft Tensioned Lazy Kate which is awesome along with a basket full of other items including practice fiber, additional flyer and bobbins. I've been spending quite a bit of time on Pinterest finding inspiration on house interior decorating and other ideas that will come in handy for when we get our own place. I've been looking for some cool ideas for designing my own fiber space. 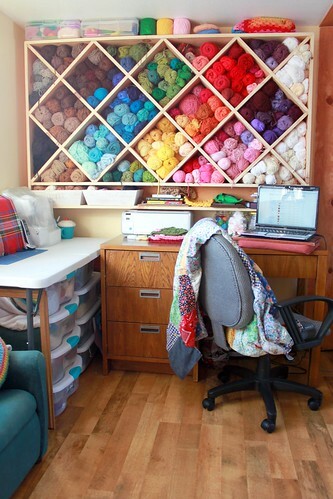 Doubt I'll be able to have my own fiber studio room but I at least want a single designated space for everything instead of randomly around the house. Here's some of the ideas I've come across so far. The Ikea Expedit shelving unit seems to be the best way to go. I love how the black one makes the colors pop. I'd like to line the bottom row with the green baskets or get the black baskets from Ikea along with shelf inserts to divvy up the space. Here's some other cool fiber zone setups! I love this space it's a store but I think the cabinet set up is definitely doable. I like how it provides extra space to display things above the cabinet maybe even bench seating. A couple weeks ago I started a learning adventure with my Aura. I wanted to learn how to Navajo ply which I've tried to learn several times in the past with not much success. I'm still trying to figure out how the settings work with the Aura it's quite a bit different than my Wee Peggy, it'll take me time to get fully adjusted to it but so far making a lot of progress. I'm really proud of this yarn. It took me awhile to get into rhythm of spinning it but once I got the settings down it was smooth sailing and unlike my previous attempts at Navajo plying that were extremely over plied, this was almost completely balanced. 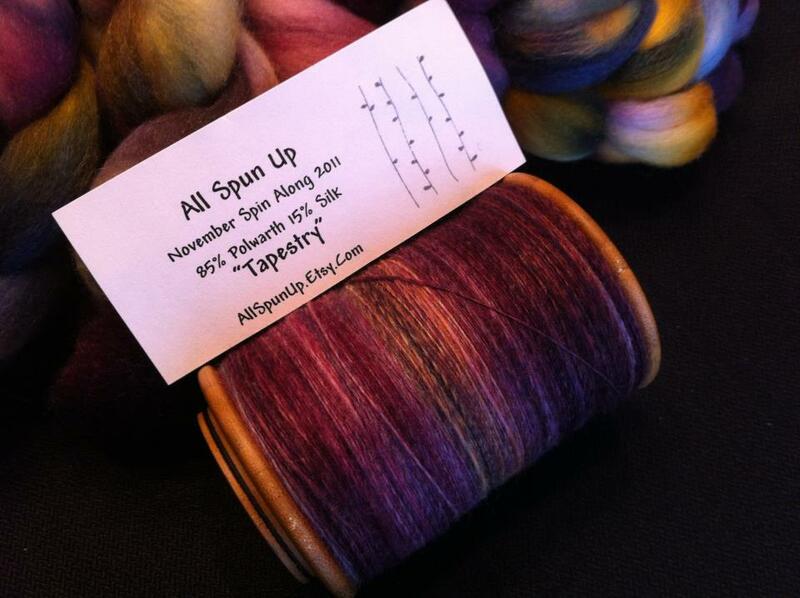 Will take some time to make my super thin singles more even but over all this came out better than I had imagined. It still needs washed so it will more than likely fluff out a bit due to the blend. 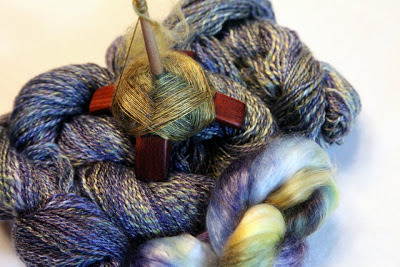 I'm still slowly working on my Water Lilies blend on my Turkish spindle. I've managed to finish 4 oz total which would put me at half way done however All Spun Up posted some extras and I picked up 2 more bumps to put me at a total of 16 oz so I can make a much larger project! 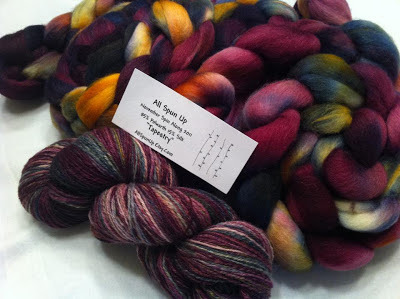 or maybe I could Navajo ply the new half for a different project not sure yet. So far with 4 oz I've spun up 392 yards will have about 780 yards total with 8 oz. 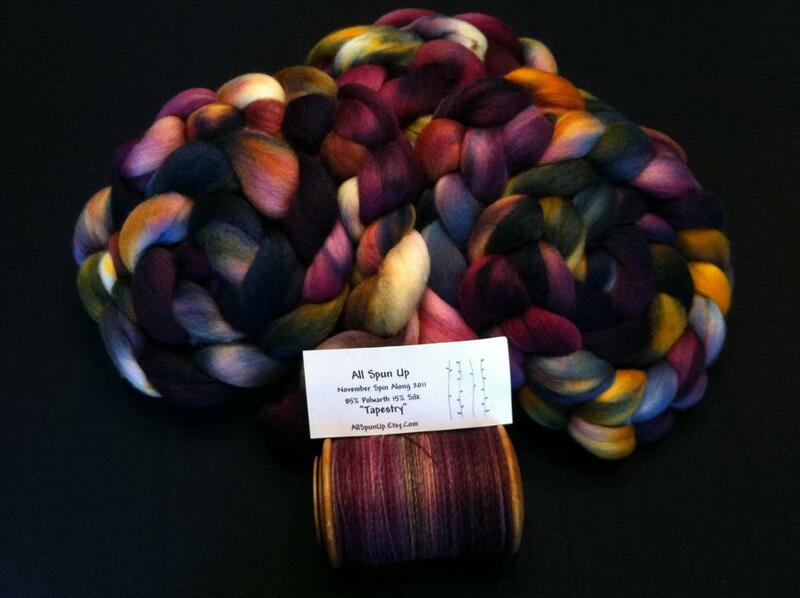 After I finish spinning Tapestry and Water Lilies I'm hoping to dive into spinning this luxurious Suri Alpaca I purchased from Woolgatherings. I'm hoping to spin it extremely thin on my Turkish spindle and then Navajo ply it. I have 8 oz total and was shocked when I got it as it's super compact in comparison to other rovings. Each bump is very small only about 6 inches in diameter and are pretty hefty for their size. 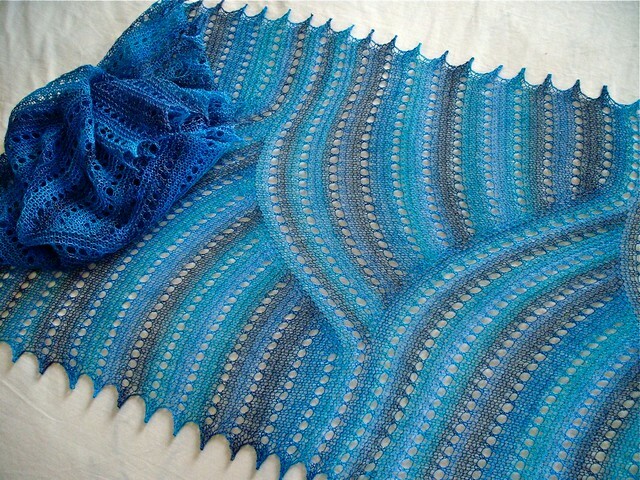 I was inspired by Colorlessblue on Ravelry by her numerous gorgeous lace weight spinning on her Turkish Spindle ad decided to get my own. 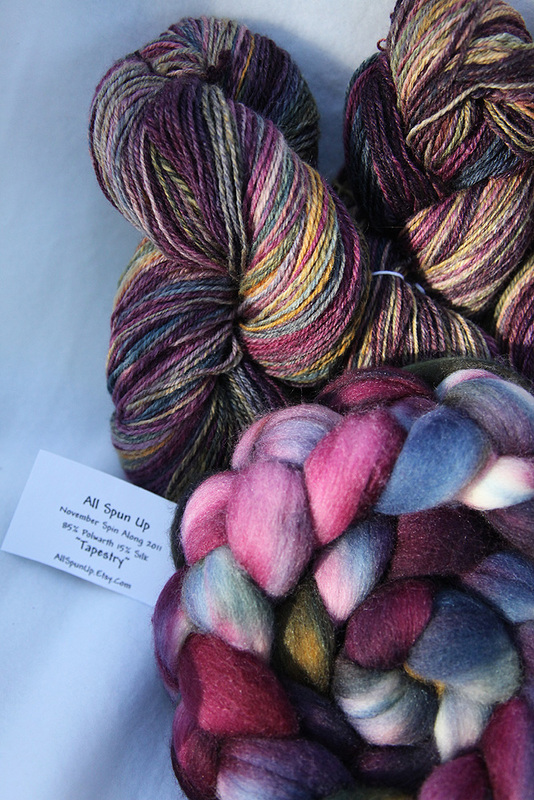 She made a gorgeous Volna Wrap and I think this Suri Alpaca would look beautiful knitted up like this.